Firefighters were seen extinguishing Metrorail train carriages at the Cape Town station. The cause of the fire is not yet known. Eleven train carriages have been destroyed and station infrastructure was damaged when a fire broke out at Cape Town Station in the CBD on Saturday afternoon, the city’s fire brigade said. Four fire engines and two water tankers attended the scene, Cape Town fire chief Theo Layne said. Platforms 15 and 16 were affected and no injuries had been reported. The cause of the fire was not yet known, he said. 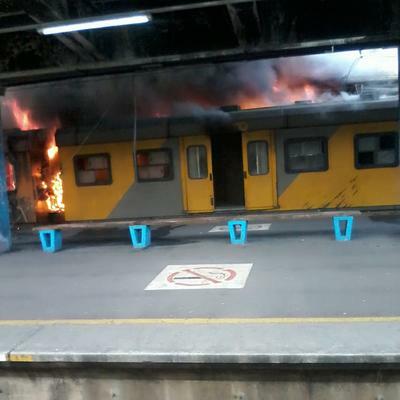 Metrorail confirmed the fire earlier on Saturday afternoon, reports EWN. FIRE: Train Carriage alight – Cape Town Station. All emergency units are being mobilized.